Alistair and Keith played in local bands back in the Seventies then lost touch with each other for thirty years. 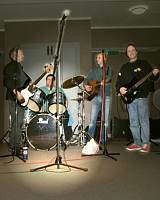 Our paths crossed again in 2004 and in 2005 we started playing at the Ivy Arch practise studios. Prior to 2005 Alistair had been having frequent acoustic ‘get togethers’ with his friends Alex and Alun. We invited them along to Ivy Arch (www.ivyarchstudios.com) for an electric jam and got on so well that we formed Neptune Sky.